New year is here and the very first catalogue of the year has now come with great offers and savings. The wedding season in India is also going on and keeping all this in mind Oriflame has launched some very new and exciting products with exclusive launch offer that make them even more irresistible. BB creams are getting popular day by day now and many leading cosmetic brands have launched their BB Cream. 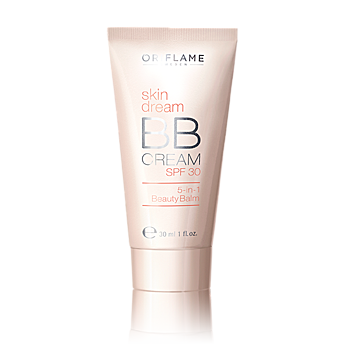 Now Oriflame has also come up with its own BB cream called Skin Dream BB cream. You think that wearing makeup is not good for your skin then try this BB cream which has becomes one of the hottest beauty trend in the makeup and fashion world. Non-Comedogenic so it won’ block your pores. For Dry skin – use on top of your normal moisturizer. For Oily skin – use only the BB cream which will take care of all your skin problems. Available in two shades light and medium has everything that you need makeup, skincare, SPF30 protection, conceals blemishes & pigmentation, reduced appearance of pores and provides hydration to give you a flawless look. Available in 30ml squeeze out tube only for Rs. 399 after 30% discount(Exclusive launch offer valid for this month only). See in current catalouge here. It has irresistible scent of fine fragrance in a delicate mist, for those looking for something light and refreshing. It has notes of floral tea accord, cherry blossom and sensual sandalwood blend in perfect harmony. Available in 150 ml spray bottle only for exclusive launch price Rs.525 after 25% discount(valid only for this month). This lightly scented all over body fragrance mist has notes of jasmine tea, wild rose and elegant white woods. The green colored bottle looks very refreshing and the fragrances will captures the calms of refreshing breeze whispering your name. Available in 150 ml spray bottle for Rs. 525 after 25% discount (Exclusive launch offer valid for this month only). The alluring notes of this Mystic Caress will titillates your senses. Have the gorgeous notes of peony and toffee tea blend with the refinement of agar wood which will evoke your sensual ambiance. Available in 150 ml spray bottle for Rs. 525 after 25% discount (Exclusive launch offer valid for this month only). The shower gel and Deodorant have the properties of Ginseng and Passion fruit. It keeps you refreshed and revitalized, stimulates your senses with this unique fusion. Passion Fruit – It is rich in Vitamin A and C which is useful in soothing and conditioning effects. Has a subtle tropical scent which gently cleans with soft and creamy foam. Available in 250 ml bottle for Rs. 285 after 25 % discount (Exclusive launch offer valid for this month only). It has quick drying formula which is light and creamy and is also anti- antiperspirant which gives long lasting protection against body odour. Available in 50 ml roll on bottle with discount (Exclusive launch offer valid for this month only). This range of face wash face cream and eye gel have delicious and juicy Pear and Nectarine which are full of nature’s goodness. Nectarine – It is enriched with healthy components and moisturizing properties. Pear – it is extremely rich in nutrients and antioxidant that protects your skin and help it recover from stress. They keep skin nourished, moisturized , and looking full of life. It is light and refreshing that can be used in mornings and evenings. The cream moisturizes, protects and softens the skin with the extracts of Pear and Nectarine. Available in a 75ml tub for Rs. 285 with 25% discount (Exclusive launch offer valid for this month only). Contains Pear and Nectarine extracts which has antioxidants to gently clean and protect your skin. Available in 150 ml bottle for Rs 259 after 25 % discount (Exclusive launch offer valid for this month only). Have extracts of Pear and Nectarine which gives refreshing, cooling and hydrating effect to your eyes. It keep your eyes looking younger and refreshed. Available in 15 ml tube for Rs 219 with discount (Exclusive launch offer valid for this month only). It will protect your skin against dryness and roughness with coconut flavor. Can be used on lips, elbows, cuticles, heels or any other body part having very dry area. Available in small cute tub packaging with 15ml for Rs 115 with 50% discount (Exclusive launch offer valid for this month only). Hope you enjoyed reading the post. Please share your valuable suggestions and feedback with us in the comment section below. Post by guest blogger VSS. VSS is a Beauty Blogger and owns a blog The Mirror On My Wall. She has great interest in Beauty products, fashion, and cooking and her blog is the platform where she can share her experiences. You can read more about her and visit her blog.